The perfect treat for a night of self-pampering! 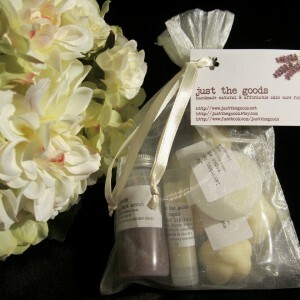 Packed in an ivory organza bag with ribbon drawstring, this set includes 1 set of fizzing bath melts, 1 bottle of deodorizing foot scrub, 1 mini body butter, and 1 lip balm. Many people are unaware that most candles are made from a petroleum-based wax called paraffin, which is a byproduct of fuel refining. Simplicity candles are made from soybean & the scents used are naturally derived from essential oils. Made in Manitoba, FDA approved food safe, BPA-free and phthalate free. Simple to clean, either wipe or machine wash on cold. Sling Sister bags are available in 2 sizes, and have many uses other than storing food. Store crayons, cell phone, ipods, cosmetics, coins, and much more! Naturally Sweetened with 100% Birchwood Xylitol. Safe for diabetics, reduces cavity-causing bacteria & freshens breath. Source handles are molded from recycled Dollar bills/Recycled Flax and Recycled Wood all blended with recycled polypropylene resulting in a bio-plastic that is 100% renewable or recycled.